bed bug activity and harborage, such as on furniture and bed frame legs, between the mattress and box spring, on the floor and under furniture. 1. If desired, remove Tab B along perforation. 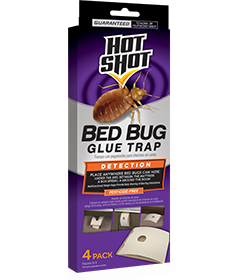 Check trap at least once per week for bed bug evidence, such as small, reddish brown bugs the size of an apple seed, small blood stains or dark excreta spots, dead bed bugs, shed skins or small whitish eggs. 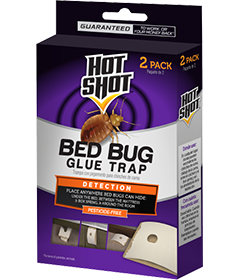 If no evidence of bed bugs is noticed on the glue, be sure to check along inside of fold line and where Tabs C and D meet as this is where bed bugs will hide. Storage: Store in a dry place inaccessible to children and pets. Disposal: Place trap into plastic bag and tightly seal bag. Make sure bag does not have any holes, rips or tears. Discard in trash immediately. CAUTION. Keep out of reach of children and pets. Do not place traps where non-target animals may come in contact. In case of accidental contact with glue, use vegetable or baby oil to remove from skin. Wash hands thoroughly with soap and water after handling trap.